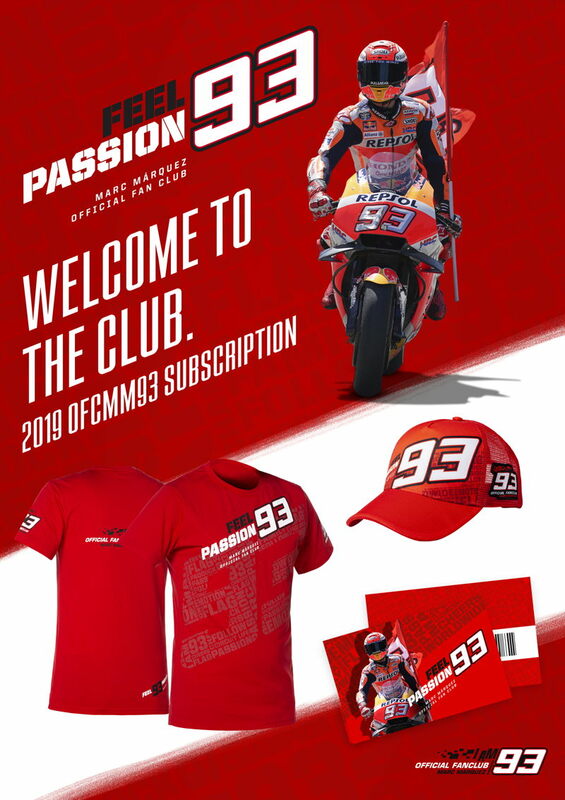 Do you want to be a member of the Official Fan Club Marc Márquez 93 family and share your passion? It easy, just fill in the form, and once the payment has been made, you will receive by post your membership card which will be valid for 1 year (from January 1 to December 31) and a gift pack that this year includes a limited edition T-shirt, a cap and of course your membership card. Know the advantages of being a member. If you are a member you get a permanent discount coupon in the official store, you can also take advantage of special offers. In some Grands Prix we have discounts for members of the Fan Club Tribune, in addition, we always raffle prizes among the members that are in our Tribune. Learn more about tickets for the Fan Club tribune. At Grands Prix we raffle paddock access passes among all the members that have a ticket at the Fan Club Tribune, you can win a chance to see Marc Márquez and take a picture with him. During the year, special events are organized, such as the final seasonal dinner, which is raffled among all the members, and Marc Márquez is present.